Last week we took a look at the occurrence of streaks in the NHL and found that the rate of winning or losing streaks wasn't any different than what we'd expect from random chance. This was pretty cool in terms of modelling the NHL for next season, as it showed that individual games in the NHL could accurately be modeled as independent of the results of previous games. I couldn't think of a great label for the y-axis, so let me describe the graph a little bit better. The x-axis is the number of days since the previous game played by that team. For each category of days since previous game, the percentage of wins was calculated, and then compared to the percentage of games that the team won over all 82 games, which is presented on the y-axis. If the data points are above 1.0, that means that the team did better than average after that number of days off, and vice versa. The grey data points are the results from each team, and the blue squares are the average for each set. Not so surprisingly, teams tend to do worse when they've only had a day since their last game (on average, they do 20% worse than normal, in fact). Their results tend to improve from there so that they do about average when given a two-day break, and then teams tend to do about 10% better than average when given a three-day break. By the time that a team has had a four-day break, though, they tend to do as well as average again, though with a significantly larger variance between teams. The results from the 5-, 6-, and 7-day breaks were much less consistent - only about two-thirds of teams had 5- or 7-day breaks, for instance, and only 10 teams had a 6-day break in their schedule. However, on average for the 5+ day breaks, teams tend to do exactly as well as average (no bonus or penalty either way). 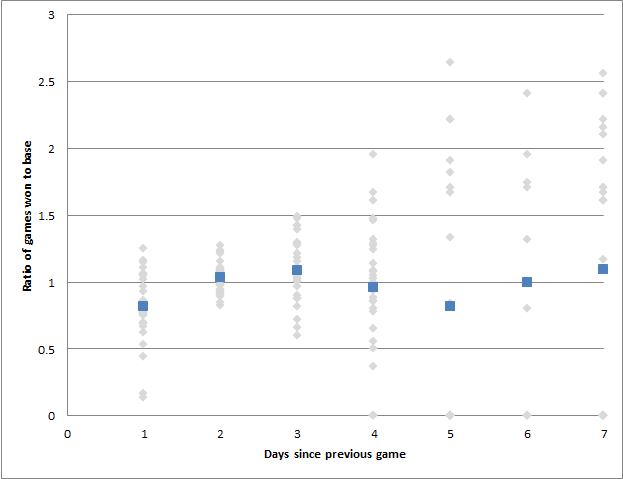 Fortunately, the vast majority of games for each team take place after a two-day breaks, and that's fairly consistent between all the teams. Also, the number of one-day breaks is typically about the same as three-day breaks for individual teams, which I'm sure is planned deliberately.